India House staff and volunteers pose in front of nearly empty grocery cartons. HOUSTON: India House mission is to unite cultures, build bridges, and serve the community. 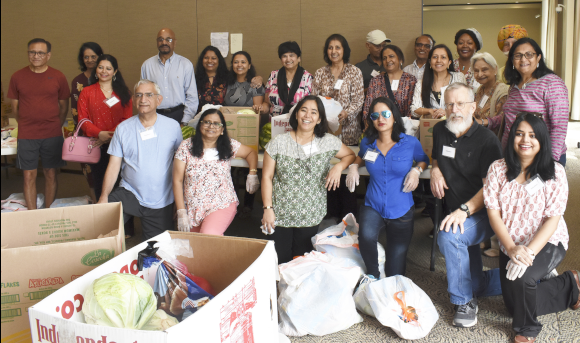 On Tuesday, September 25, India House achieved a major milestone on its mission to serve the community by launching food distribution to needy families in collaboration with the Houston Food Bank. During its inaugural food distribution, India House parceled out groceries to more than 100 families. 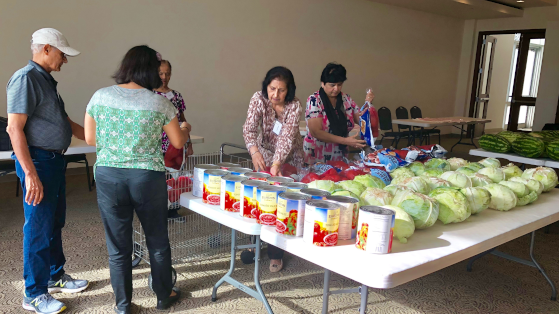 “As needy families in the nearby neighborhoods learn about this service, we expect to increase food distribution to about 400 families every month,” explained Col. Vipin Kumar (Retired), Executive Director of India House. Volunteers unloading groceries from the Houston Food Bank refrigerated truck. Rani & Harinder Juneja sponsored the September 25th food distribution session. Mrs. Juneja was at India House bright and early at 8:00 am to help with the food distribution. Joining her were more than 25 volunteers, few of whom were participants of the Free Yoga classes, which are held thrice a week at India House. Col. Kumar and India House staff members Pallavi Surana, Bhumi Parmar and Khin Chao had planned in advance to set up a token system to help streamline the distribution process. Volunteers provided one token per needy family and documented their status as per Houston Food Bank rules. Rani Juneja (center), Vijay Dhingra and other volunteers helped organize the groceries into individual piles. 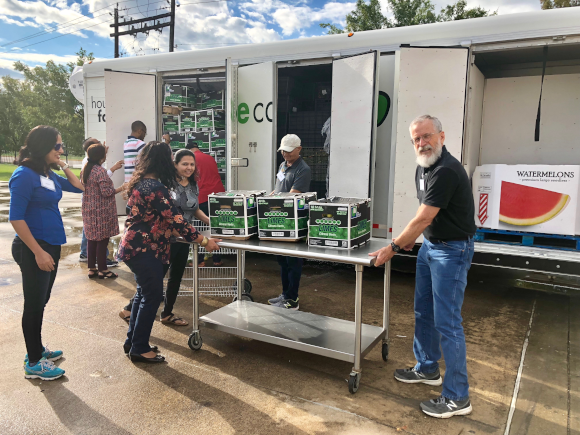 A Houston Food Bank truck arrived in the morning at 7:45 am with large boxes of cereal, vegetables such as potatoes, cabbages, limes, tomato sauce cans, and fruits such as watermelons. India House staff set up an assembly line to bring in the food and organize assorted items into plastic bags for each family. 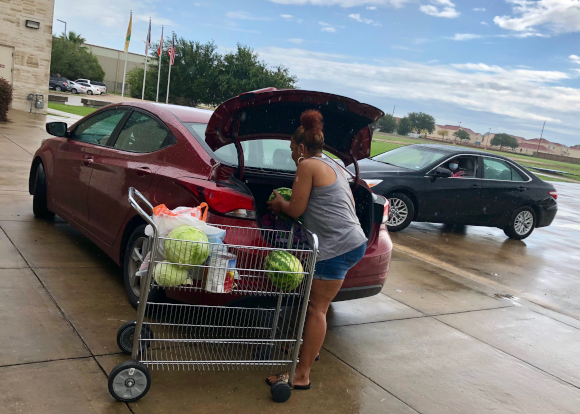 In orderly fashion, the families came by the side entrance to India House and were helped by volunteers to load the groceries in their cars. Several families did not have cars and either walked back to their neighborhood home or waited for Metro transportation for a ride home. Families lined up at the side entrance of India House to load groceries. Many of the volunteers were gratified by their charity service and are looking forward to the next monthly food distribution session on October 16th and 30th from 8 am to 1 pm. Many of the needy families expressed their gratitude to India House, Houston Food Bank and the volunteers. India House Houston is a 501 (c) 3 non-profit organization located in Houston, Texas. Our mission is to united cultures, create bridges and serve the community by bringing resources, education, services and Indian culture to Houstonians.